Madoka Movie Project and AFA12 are proud to present Puella Magi Madoka Magica Movie at Anime Festival Asia 2012 in Singapore! "Part 1: Beginning" and "Part 2: Eternal" of the movie trilogy will be screened in Singapore at AFA12. Puella Magi Madoka Magica is directed by by Aikiyuki Shinbo, Script by Gen Urobuchi (nitroplus), and Original Character design by Ume Aoki, with music by Yuki Kajiura. Enter the world of adorable everyday girls as they encounter the world of the magical girls. From the amazing series, now comes the Movie. The first volume of the TV series' blu-ray sold more than 53,000 copies in the first week, setting a record in TV Anime history. The second volume then proceeds to break the record of the first. It's truly the representative work of 2011! Despite this being a movie adapted from the 12 episode series, the movie include many new elements not found in the series. Elements will touch even those who have watched the series. Puella Magi Madoka Magica movie Part 1: Beginning was premiered on 6th October 2012, and Part 2 followed just 1 week later on the 13th of October in Japan. So be among the first outside of Japan to watch Puella Magi Madoka Magica movie, and bring home also a special movie premium package! Early bird ticket will be on sale from 12pm on 24th of October 2012, Wednesday onwards both physically at the AFA SHOP, in *SCAPE and online via Event CliQue. And normal ticketing will commence from the 1st of November, Thursday onwards. The Puella Magi Madoka Magica movie tickets do not include Festival + Stage tickets. Movie ticket purchased is only meant for the respective movie screening and do not entitle holder to normal festival access or re-entry in to the stage hall after the movie screening. Puella Magi Madoka Magica follows the story of a 14 year old girl named Madoka Kaname. Madoka is offered the opportunity of gaining magical powers if she agrees to make a contract with a strange little being named Kyubey. Kyubey will also grant Madoka one wish, but in exchange she shall risk her life by accepting the responsibilities of fighting witches. Little does Madoka know what the real risks of making a contract has in-store for her. The films will be presented in Japanese Audio with English Subtitles. 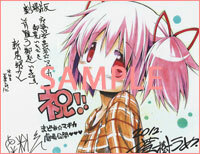 Watch the Puella Magi Madoka Magica Movie at AFA12 and bring home these exclusives! ** The Puella Magi Madoka Magica movie tickets do not include Festival + Stage tickets. 10 NOV 2012 (SAT) ONLY. 11 NOV 2012 (SUN) ONLY. ** AFA Stage + Festival and Concert tickets sold separately. Please note that cameras of any sort will not be allowed into the venue for the duration of the screening, any video recording or picture taking is also not allowed. Bag checks will be conducted and cameras will be kept in storage till after the movie. When will Madoka Movie tickets go on sale? Two day ticket packages are now on sale. How can I buy Madoka Movie tickets? You can buy the tickets on the Eventclique website or at the AFA Shop, located in *SCAPE. Please note each transaction is limited to a maximum of 10 package/tickets. How can I collect my Madoka Movie tickets if I purchased them online? You can collect the tickets at the venue. Please note that the confirmation e-mail that is sent after purchase and the purchaser's NRIC or passport is required as identification to collect the tickets. Should the person who bought the ticket(s) be unable to pickup the tickets, a letter of authorization and photocopy of the person's photo ID will be required to be produced at the point of collection. Where will the collection point at the venue be and what are the opening hours? I'm a foreigner, how can I purchase the Madoka Movie tickets? Tickets may be paid through credit card, both online and at the venue. You may collect your ticket at the designated ticketing counter at the venue on the event days. How can I pay for my tickets on the Event Clique website? Payment can be made through VISA and Mastercard credit and debit cards online. Can I pay cash for the Madoka Movie tickets? You can purchase the ticket at the AFA Shop, located in *SCAPE #02-02. Two day ticket packages will have an additional, single $5 ticketing charge and 1 day tickets will have an additional, single $3 ticketing charge. What sort of ticketing plan is being used for the Madoka Movie? The Madoka Movie screenings are based on reserved seating. Where can I collect my Movie Premiums? Do I need to show anything to redeem the Movie Premiums? Please note customers are required to present your Eventclique ticket(s) at the counter in order to redeem the items. An indication will be made on the ticket(s) redeemed. Customers who have purchased any of the packages will be required to present all two tickets to redeem their items. Redemption will be refused if any of the tickets are not presented. Is there any deadline in purchasing Madoka Movie tickets? Online ticket sales will be cut off the day before the concert on 08.11.12 (THU) at 1200h. Sales will resume at the venue on 10.11.12 (FRI) at 12pm outside Singapore Expo Hall 7. Will there be any on-site ticket sales for "I Love Anisong" ticket(s) on the day itself? Sales will begin at the venue on 10.11.12 (FRI) at 12pm outside Singapore Expo Hall 7. However, seats are subject to availability. What payment method can I choose for on-site ticket purchase at the venue? All I Love Anisongs concerts will start at 7.30pm on all days and doors will open at 6.30pm. Am I allowed to take pictures or record videos during the movie? Do I need to buy any other tickets to buy the Madoka movie tickets? You are not required to buy any other tickets to access the Madoka movie screenings. Can Madoka Movie tickets help me gain entry to the festival? Madoka Magica Movie tickets do not come with either Festival or Festiva + Stage tickets. These tickets will have to be bought separately.